So said Alf Field, a frequent contributor of articles to Gold-eagle.com until his "retirement" back in 2008, in a touching, informative, insightful and predictive 6,500 word speech he came out of retirement to give at the recent Sydney Gold Symposium. The portion of the speech entitled "ADDENDUM: Update of the Elliott Wave Gold Analysis" has been edited ( [ ] ), abridged (…) and reformatted wherever deemed necessary to ensure a fast and easy read. Field's views and conclusions are unaltered and no personal comments have been included to maintain the integrity of the original article. Please note that this paragraph must be included in any article re-posting to avoid copyright infringement. On 31 December 1974 the largest and wealthiest nation on Earth allowed its citizens to buy and own gold…and the obvious conclusion was that it was necessary to resort to technical analysis to find a way to predict movements in the gold price. I experimented with a variety of technical systems and then got lucky. 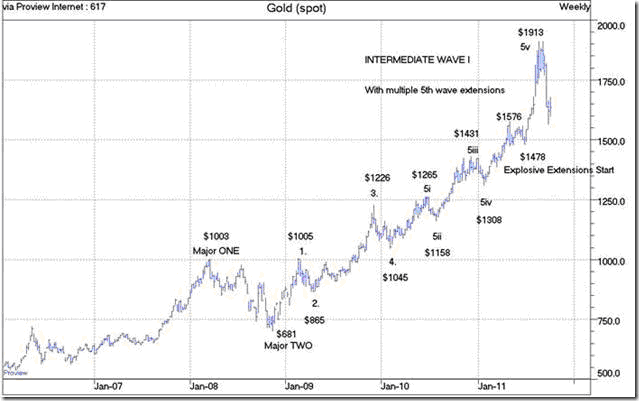 I discovered that the Elliott Wave Theory (EW) gave superb results in predicting the gold price. I couldn't get the same great results using EW in other commodities or markets. EW is a complicated system with many difficult rules, but I will try and explain it in simple terms. The technique is to concentrate on the corrections. In terms of EW, the sequence in a bull market is as follows. The market rises, has a 4% correction, rises, has a 4% correction and rises again. At this point the next correction jumps from 4% to a larger degree of magnitude, say 8%. The market then repeats the sequence: a rise, a 4% correction, a rise, a 4% correction, a rise and another 8% correction. When the market is eventually due a third 8% correction, the magnitude of that correction jumps from 8% to 16%. This sequence is repeated until two 16% corrections have occurred when the size of the next big correction jumps to 32%. The beauty of EW is that the corrections in gold are remarkably regular and consistent. Early in 2002 I picked up the 4%, 4%, 8% rhythm in the gold market which convinced me that a new bull market had started in gold. Another feature of EW is that once one is confident that these percentages have been established and one has some idea of the approximate size of the up moves, simple arithmetic allows one to calculate a forecast of the future price trend. Using this method I calculated that the gold price should rise from the $300 ruling in 2002 to at least $750 without having anything worse than two 16% corrections on the way. That was valuable information at that time. Furthermore, from the $750 target a big 32% correction could be expected to about $500. Then the bull market would resume, rising to perhaps $2,500 before another 32% correction occurred. The final up-move would take the gold price to much higher levels, possibly $6,000. Once again, a valuable insight when gold was $300 in 2002. The gold price actually got to a shade over $1000 in March 2008, a four-fold increase instead of the expected three-fold rise to $750. That was the point at which the 32% correction was due. Over the next seven months the gold price in the spot market declined from $1003 to $680, an exact 32% correction. Using PM gold fixings, the numbers were slightly different. The high was $1011.0 and the low $712.5, making the correction slightly less than 30%, but quite adequate. 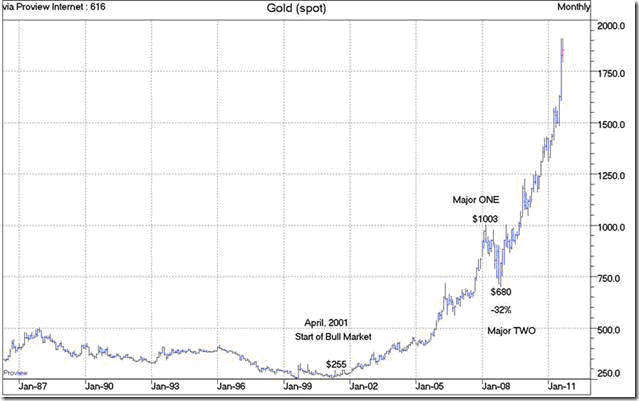 The above chart depicts the monthly spot gold prices since the start of the gold bull market in April 2001 when gold was $255. The 32% correction in terms of spot gold is clearly shown. The high at $1003 and the low at $680 established the extremities of the first two major waves of the bull market, shown in the chart as Major ONE and Major TWO. The gold bull market is in the process of working its way upward through Major THREE, often the longest and strongest wave in the bull market. There have been a number of interesting and unusual developments in Major THREE which will be discussed later. 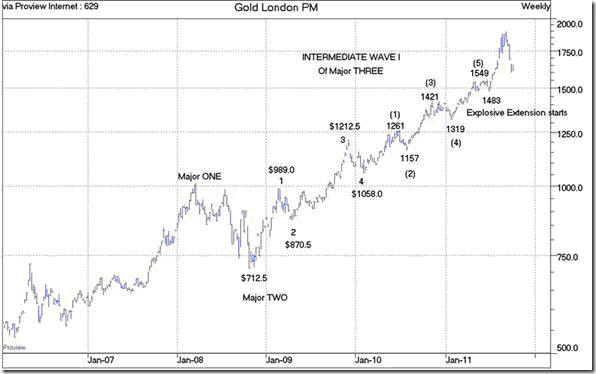 [Below I] reveal some interesting things about the EW moves in gold since the $681 low in October 2008. That low was the start of the Major THREE wave. In Major ONE I mentioned that the corrections were 4%, 8%, 16% and then 32%. We know that Major THREE will likely be longer and stronger than the prior Major ONE up wave. It is logical to expect that the corrections in major THREE will be a larger percentage than those experienced in Major ONE. [The above] are typical of the beautifully consistent sizes of EW waves in gold. There are two up waves of about 39% and two corrections of about 12%. Several things can be determined from these numbers. In February 2010 it was possible to pencil in a target for wave 5 of $1470, being a 39% rise from the wave 4 low of $1058. The 12% corrections are larger than the 8% for the equivalent waves in Major ONE, which was expected. One can deduce that the correction to follow wave 5 will be one degree larger than 12%, possibly double this figure. The target for wave 5 of $1470 was exceeded mainly because this became an extended wave. It reached a high of $1549 for a gain of 46.4%…Extended waves are simply waves that subdivide into an additional 5 waves. It happens mainly to 5th waves and generally makes life difficult for EW analysts. [It is] difficult yes, but not impossible. NOTE: From the $1319 start of wave (5) above, the target price was $1319 + 19.2%, the same gain as wave (1), giving a target of $1572. The high price for gold in wave (5) in the spot market was $1576 on a day (2 May 2011) when the UK had a public holiday and there was no London PM fix available. Thus the gain for wave (5) was stunted in terms of PM fixes. This is not satisfactory and it became necessary to revert to analyzing the waves in spot gold prices to get accurate readings. This was also required in order to pick up the minor waves in the final two extensions which were explosive in nature. To illustrate how to analyze gold using EW through this difficult period, it is best to work through the time line as it actually happened. As noted above, the expectation was that following the completion of the extended wave 5, a correction one degree larger than 12% would occur from the peak of wave (5) at $1576. Gold had a minor correction to $1478 in the spot market and then started a sharp upward move. When gold went to a new high above $1576 the probability of the big 24% (give or take 3%) correction occurring at that time receded. The stronger probability was that a new 5th wave extension was underway. This was the first of the explosive series of extensions in gold. It became an historic sequence of four 5th wave extensions in declining orders of magnitude. At the end of each extended wave, the spectre of the bigger correction (21% to 27%) came into focus. With each new high, the bigger correction was delayed and a new extended wave was born. 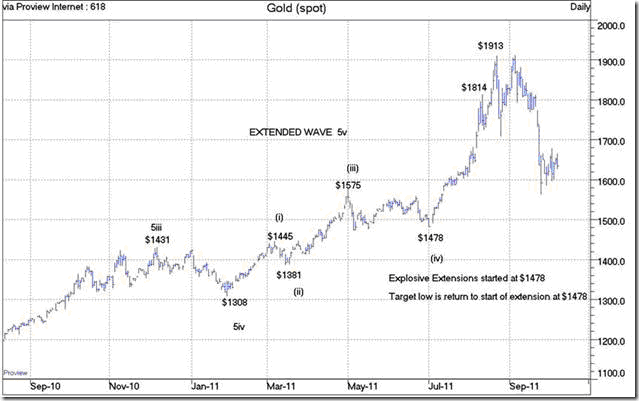 At $1814, after three 5th wave extensions, the probability that $1814 was THE high was about 80%. Another extension at an even smaller degree was accorded only a 15% probability. The remaining 5% covered the possibility that the wave count was wrong and that a completely different outcome was evolving. From $1814 gold had a minor correction to $1723, then blasted through $1814 to new all time high prices. 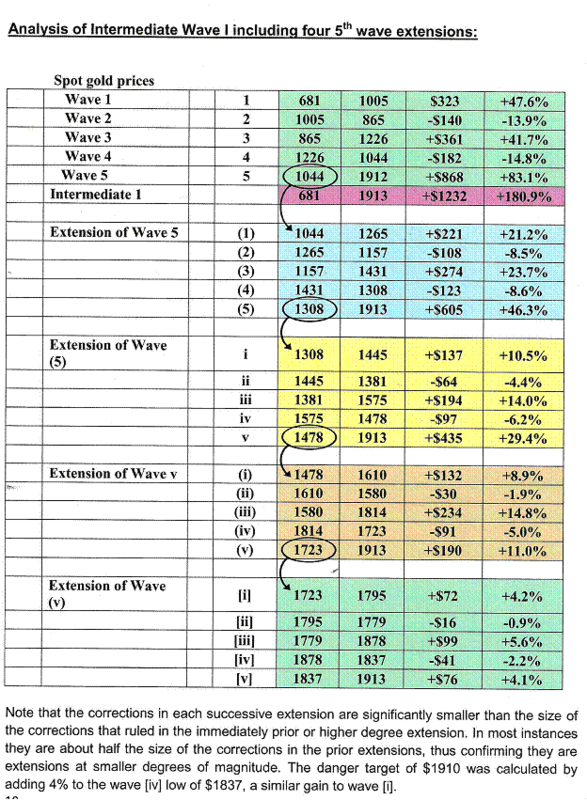 The odds of a fourth 5th wave extension at the smallest degree changed from a meager 15% to a 90% certainty. The wave count at this smallest degree helped to determine in real time that at a price over $1910 gold was in serious danger of an important top, with the bigger correction certain to follow. We can now consider the possible magnitude of the current correction from the $1913 top. The correction will be one degree larger than the prior corrections, 12% in PM fixes and 14% in spot gold, an average of 13%. That compares with 8% in Major ONE. Both 8 and 13 are Fibonacci numbers, so it may be that the next correction could be 21%, the next Fibonacci number. 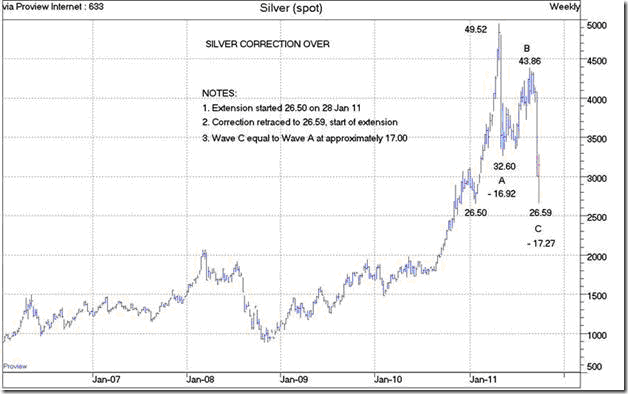 This analysis was prepared on 27 September 2011, the day after spot silver reached a low price of $26.59. The start of the extension was at $26.50 on 28 January 2011. A mere 3 months later, at the end of April, silver topped at $49.50, a very obvious explosive advance. Silver then traced out an A-B-C correction where the A and C waves were declines of similar size at $17 each, a typical EW relationship. At that low point of $26.59 on 26 Sept 2011 - the silver price had exactly retraced the full gain achieved in the explosive extension. The conclusion was that there was at least an 80% probability that the silver correction had bottomed at $26.59. If gold retraces the exact gain achieved during the explosive advance from $1478 to $1913, which occurred in just seven weeks, it will represent a decline of 22.8%. That is nicely within the above anticipated range of 21% to 26% for the current decline in gold. There is a possibility that the spike drop to $1531 on 26 September marked the low point of the correction in gold. The midpoint of the correction from $1576 to $1478 is $1527, close to $1531. If $1531 was the low, it was a decline of 20%. This is slightly below expectations, but it still qualifies as one degree larger than 13%. At the date of writing (7 Nov 2011), gold has recovered to $1767, which is a 61.8% retracement of the loss from $1913 to $1531 (-$382), a typical size for this type of recovery. That leaves open the possibility (40% probability?) that gold will have another dip to test the target areas mentioned. The higher the price goes above $1767, the greater the probability that the low was in at $1531.Once this correction has been completed, Intermediate Wave III of Major THREE will be underway. This should be the largest and strongest wave in the entire gold bull market. The target for the Intermediate Wave III of Major THREE should be around $4,500 with only two 13% corrections on the way.